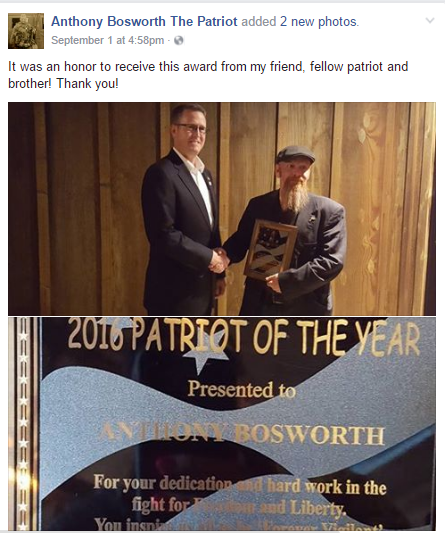 On Facebook earlier this month, former Yakima County Sheriff Candidate Anthony Bosworth posted a photograph of Spokane Valley Rep. Matt Shea presenting him with an award naming Bosworth a "2016 Patriot of the Year." Shea, who's closely connected with the Inland Northwest's American Redoubt movement, has praised Bosworth as a patriot before, but this makes it official. You may recognize Bosworth if you've been closely following the fallout from the Oregon standoff at the Malheur National Wildlife Refuge in January. “I traveled to the refuge in an attempt to de-escalate the situation… at the request of the Coalition of Western States,” Bosworth wrote in an email. Bosworth also helped militants – including Blaine Cooper, another occupation organizer – flee the compound. In a recording of an April speech before the Constitutional Republicans, Shea casts himself as a hero who helped make sure the Malheur refuge occupiers got their message out and was resolved — other than the shooting death of rancher LaVoy Finicum — relatively peacefully. 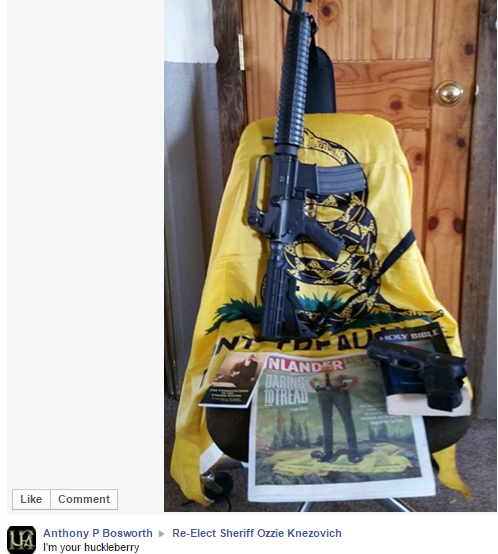 Shea suggests Malheur would have been a massacre without his and his allies' involvement. Bosworth was an odd choice for a man to de-escalate a tense situation. He has a history of confrontation, to say the least. The whole thing won Bosworth fans and respect from some conservatives. "Most of us in the liberty movement, myself included, are too chicken to put everything on the line, as he does," local gun-rights activist Vitaliy Maksimov told us last year. But on some occasions, Bosworth has allegedly become violent. Sepulvado reports he got into a fistfight at the late rancher Finicum’s funeral, after convicted felon Adrian Sewell accused Bosworth of stealing Finicum's guns the night they left the refuge. And after the standoff, Bosworth made headlines again, this time for an alleged assault. Here's the Yakima Herald-Republic a few months ago. Yakima police said they responded Tuesday afternoon to a report that Bosworth had choked his 17-year-old daughter and dragged her by the hair in the parking lot of a driving school in the 2500 block of West Nob Hill Boulevard. He’s also accused of hitting a 31-year-old woman who tried to intervene as other witnesses recorded part of the incident on their cellphones, according to the arrest report. Bosworth, 42, was booked later that evening at the county jail on suspicion of second- and fourth-degree assault. Bartheld indicated that Bosworth’s daughter is now under the care of the state Child Protective Services unit and ordered him to have no contact with her. The next hearing for the fourth-degree domestic violence charge, will take place in Yakima Municipal Court this Friday. "This is the Patriot of the Year? I’m not so sure about that," says Sheriff Ozzie Knezovich, a frequent Shea critic. "If Shea’s definition of a 'patriot' is a man that would hit a woman, I don’t think so." The comment "I'm your huckleberry," of course, references Doc Holliday's defiant line in Tombstone that precedes a shootout. Knezovich took it as an implied threat. It caused Kit Lange, a leader of a "Liberty For All" 3 Percenter group in Washington state, to distance her group from Bosworth. Last December, Lange told us that she and Sam Wilson, another Liberty For All leader, "were not comfortable with the photos that were displayed. "We wanted to focus more on training and educating people as opposed to starting that ruckus," Lange said. "We’re not looking to start a fight." 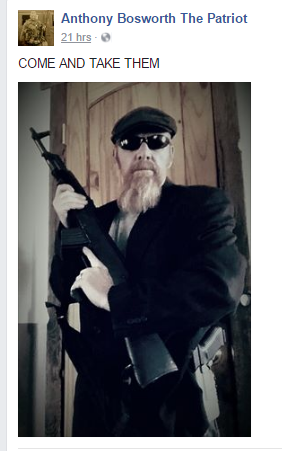 It wasn't the first time Bosworth had made a Facebook comment with threatening undertones: Here he was on Facebook on July 20, 2015. Washington State Attorney General Claims to understand the Constitution. He claims Americans owning arms of their choosing is not supported by the Constitution. Clearly he is willfully ignorant of History. Our founding fathers did not comply with the demands of a tyrannical government demanding the colonists to relinquish their only means of Defense against an over-reaching murderous tyrannical Authority. We are willing to die to preserve the Liberties of our children. I emailed both for comment on Friday and will update the post if they respond. On some rare occasions, Shea has spoken with the Inlander, but on others he's blocked media outlets who attempt to ask him questions.